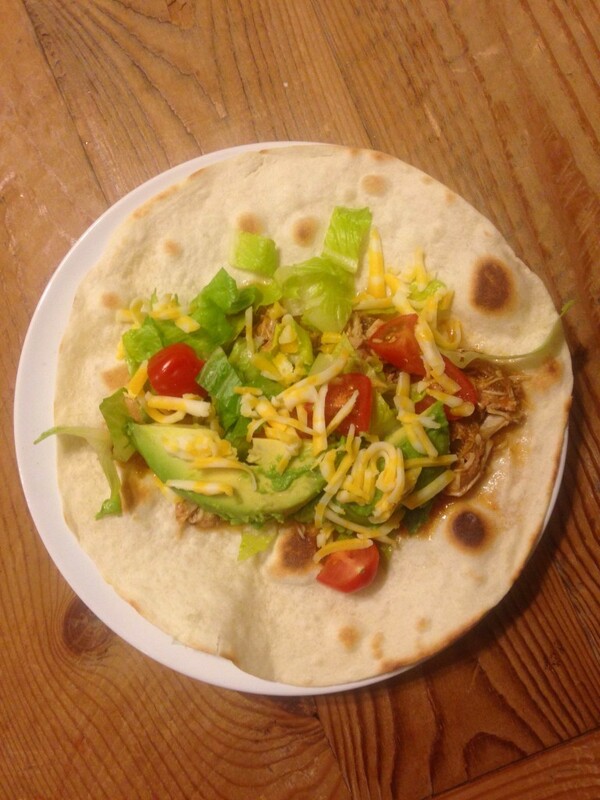 I’ve posted my chicken taco recipe before, but thought I’d elaborate a bit on why it’s on my “Go-To” list and honestly, the easiest dinner ever. It’s simple and takes minimal hands-on time. A few ingredients in the slow-cooker, set it and forget it. Everyone (well, almost everyone) loves a taco. There are very few recipes that my entire family enjoys, and this is one of them. There’s never a complaint at the table when I serve this. It’s customizable. I set up a taco bar and let the kids fill their tortillas or taco shells with the ingredients of their choosing. I’ve found that giving kids some choices about their vegetables works wonders. For example: Do you want tomatoes or lettuce? Or last night I required the lettuce, but let them pick how much they wanted, and if they wanted it on their taco or on the side like a salad. This resulted in much less grumbling, and they even took more lettuce than I expected. 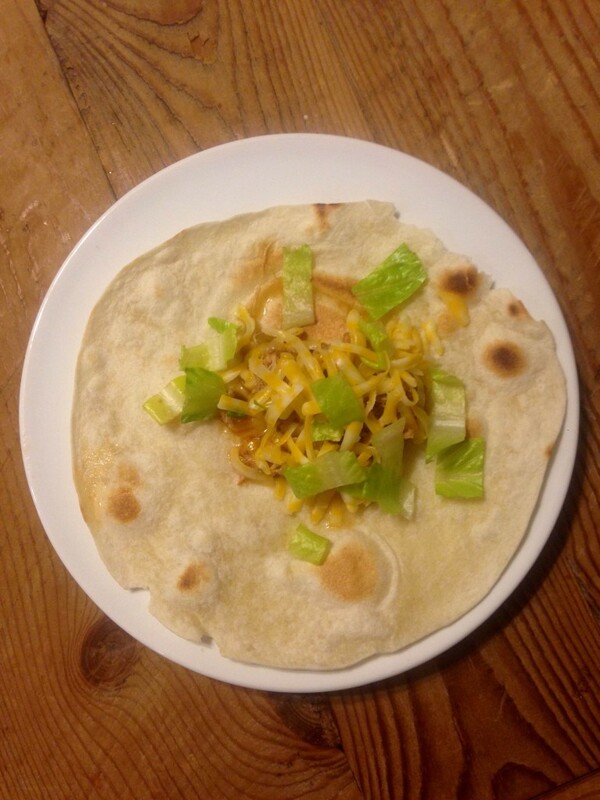 Related to #4-my husband and I sometimes prefer salad to tacos. Easy peasy—-chop up some extra lettuce or use a salad mix. 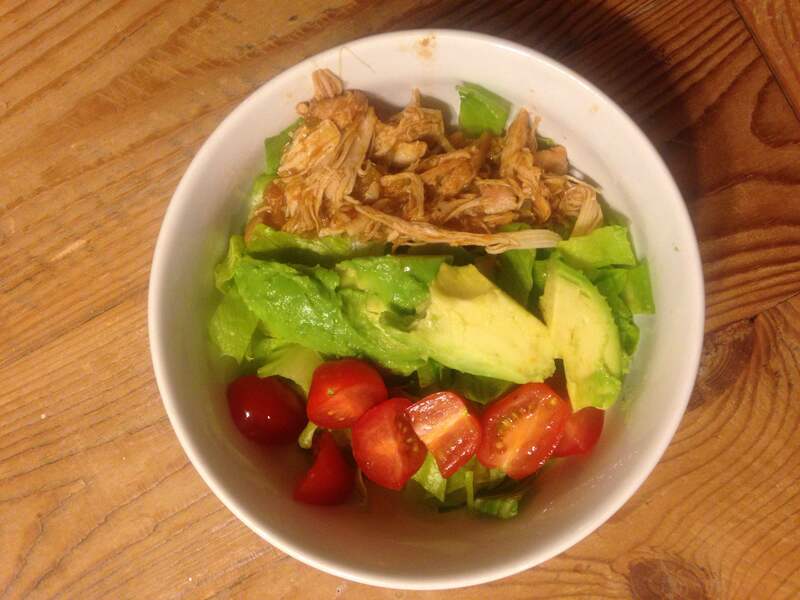 Top with the chicken, avocado, tomatoes, or whatever sounds good and use salsa as dressing. This daughter is not a big eater, nor is she fan of meat. No, her tortilla is not overflowing with filling, but I’m ok with that. She ate the whole taco, then finished her meal with some fruit. I call that a balanced meal. And this daughter loves her some food, especially chicken tacos. She has a bigger appetite than her sister, and went back for seconds. Since I’m currently participating in the Whole Life Challenge, I skipped the tortilla and cheese and made this salad instead. I added more chicken after I took the picture and ate every bite. We do the exact same thing with steak tacos……easy prep, customize to each person’s taste, and enjoy. Give it a try when you need a stress-free dinner with the family.